Eight teams will compete over a $50,000 prize pool and a chance to represent Team USA on the World Stage. 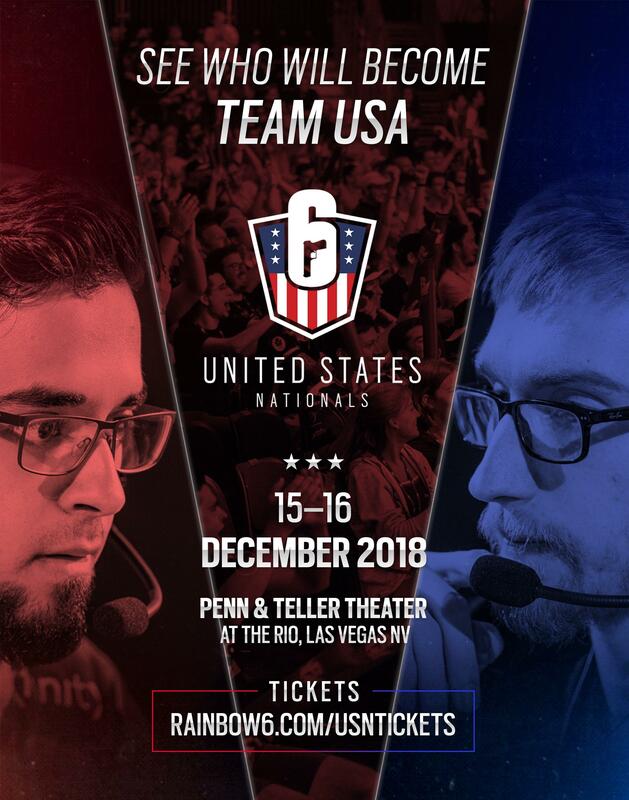 The Rainbow Six: Siege US Nationals are scheduled to take place on December 15 through December 16 at the Rio Hotel Penn & Teller Theater in Las Vegas, Nevada. The competition will see eight different teams battle it out for a chance to win a cut of the $50,000 prize pool and the honor of representing Team USA on the World Stage. This year, competing teams including Rogue, Cloud9, Mousesports, Spacestation Gaming, Evil Geniuses, and Noble Esports. With so much on the line, and more than 1.2 million fans tuning in to watch previous stages in the competition, the Rainbow Six: Siege US Nationals promises to be an exciting, action-packed event. If you’re in the area and wish to attend, you can purchase tickets right now via Ticketmaster, or purchase tickets directly through the video below to avoid any additional fees. What’s more, the link included within the video above allows you to not only purchase a ticket free of service fees, but also get a code for Credits in Rainbow Six: Siege as well as a discounted hotel room deal. That way, even if you don’t live in the Las Vegas area, you can still check out the event and soak in the sparkle of Vegas while you’re at it. If you’re lucky, you could potentially win a free hotel room as ticket purchases include entry into a special hotel room giveaway. Prefer to watch the festivities from the comfort of your own home? No problem! Not only will spectators at the Rio Theater be able to watch the Rainbow Six: Siege US Nationals, the event will also be live streamed on the official Rainbow Six Twitch and YouTube channels. Who will walk away victorious during this year’s Rainbow Six: Siege US Nationals? Tune in from home or buy tickets and watch the action live from the Rio Theater on December 15 and 16 to find out!